Recently captured juvenile pelicans wait in a warm room for their intake examination. The folks at Bird Ally X really like Jim Moore. The retired wildlife biologist knows animals, and he's always willing to help. Also, he has a van. A big van -- the better to transport sick pelicans with. And lately he's been doing a lot of that. So much that the stubborn stench of smelt will not leave the van's interior. His copper-colored Honda Odyssey has become a pelican ambulance. Since last Monday, Moore has captured close to 50 ailing brown pelicans from Trinidad and Crescent City and delivered them to the Humboldt Wildlife Care Center in Bayside, where volunteers are working to rehabilitate the birds. By the end of this Monday, the care center had admitted 130 juvenile brown pelicans for treatment and was quickly approaching capacity. It's déjà rescue for Bird Ally X. 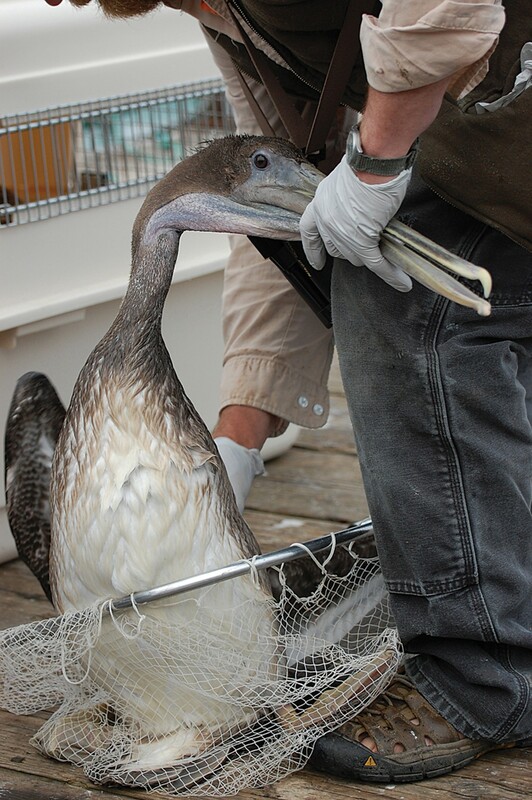 Last year the organization rescued more than 50 juvenile pelicans from Shelter Cove, Humboldt Bay and Crescent City. Most of those birds had been contaminated with fish oil. Others had large fish skeletons stuck in their throats. The main problem -- then and now -- is open fish-waste bins near cleaning stations, which offer easy but dangerous buffets for the young pelicans. They become dependent on this easy food source, and the fish oil compromises the natural waterproof quality of their feathers, making them vulnerable to hypothermia. 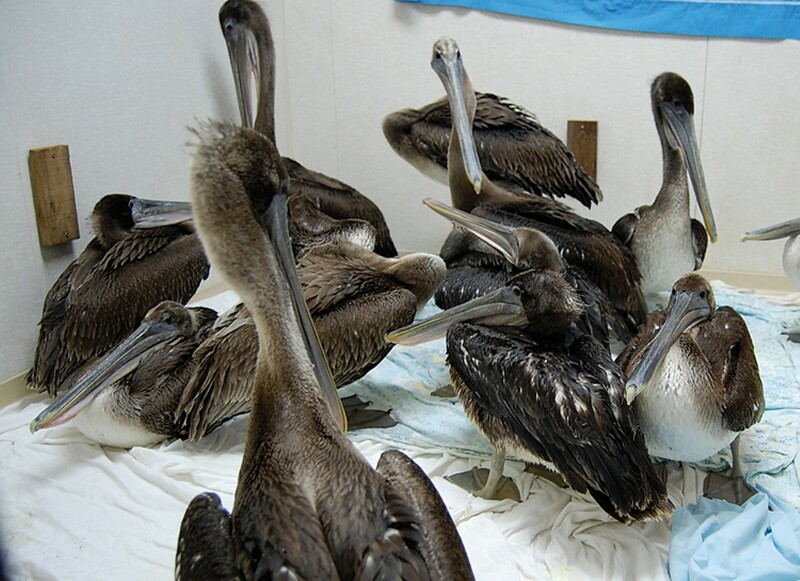 Without help, oil-drenched pelicans will die of exposure and starvation. "The frustrating thing is that this is entirely preventable and easy to fix," said Bird Ally X Co-director Monte Merrick, a ponytailed man with narrow eyes and well-worn clothes who describes his religious views on Facebook by suggesting, "Ask a pelican." On a recent afternoon Bird Ally X staff and volunteers had their hands full. They unthawed the smelt, cleaned the carrier cages, fastened heat lamps, laid down sterile towels, raised a tent for the wash station, fixed the netting in the aviary and set up a second intake room to perform basic evaluations -- because one is no longer enough. Merrick was the nucleus of the swirling activity. When volunteers were unsure what to do next, they looked for him. Fish oil isn't the only culprit in recent brown pelican deaths. The problem coincides with the breeding success of California brown pelicans, which have seen resurgent populations since being removed from the endangered species list three years ago. The first-year mortality rate for brown pelicans can be as high as 80 percent, according to the nonprofit International Bird Rescue. The most common cause is starvation. Still, Bird Ally X estimates that 95 percent of the birds that have come to the care center over the last two weeks are suffering from fish waste contamination. Pelicans typically plunge dive into the ocean, open their pouch and gather anchovies, sardines and other small fish, along with about five gallons of seawater. They eject the water and swallow their prey. It's a skill all fledglings must learn in a very short period of time, and if they're not initially successful, they grow desperately hungry and come to the docks looking for handouts. Deborah Jaques, a wildlife biologist from Astoria, Ore., said human activity has compounded the pelicans' natural mortality rate, and she's confident that mass die-offs are preventable. A good place to start, she said, is by improving the design of fish-cleaning stations. Crescent City has two outdoor stations. Fishermen take their catch to the tables, rinse and cut their filets and toss the waste into large plastic bins. Harbor staff empties the bins daily, said Crescent City Harbormaster Richard Young. The waste is then hauled to a local composting plant. Last year, the bins remained largely uncovered, which allowed pelicans to dumpster dive. Jaques said the Crescent City Harbor District didn't work quickly enough to fix the bins, so she went to Bird Ally X. The organization installed trapdoor lids -- a simple solution that's still in place today. But Young has heard complaints that people are removing the tied-down lids to grab fish scraps for crab bait, and then not bothering to replace them. He speculates that this year's bumper salmon season is producing more fish waste and bringing more people to the harbor, many of whom may be unfamiliar with harbor rules. "People think it's cute to feed the pelicans, but it's a disservice and dangerous," Young said. He's posted about 10 laminated signs around the dock to teach people about pelican safety. Harbor district employees work from 7 a.m. until 3:30 p.m., and a watchman is on duty during the late-night hours. But there are periods when the harbor is unmonitored. "We can't be everywhere and I can't station a person at the fish-cleaning station all day," Young said. Moore, the pelican ambulance driver, said the Crescent City Harbor District's efforts are helping, but more could be done: The signs could be bigger, the lids better monitored -- and really, how hard would it be to put a net structure around the stations to keep pelicans out completely? The fish-cleaning station at Shelter Cove is now completely enclosed. Dan Berman, director of conservation for the Humboldt Bay Harbor, Recreation and Conservation District, learned last Wednesday that the oiled pelicans were back. Two days later he sent staff to put a mesh roof over the structure, which was already surrounded by a chain-link fence. The pelicans now have no way of getting to the tables. But even if Shelter Cove's fish-cleaning station was fortified in iron, the waste-discharge pipe presents another threat to pelicans. Unlike Crescent City's fish stations, Shelter Cove's doesn't have waste bins. Instead, the waste gets ground up by harbor district staff and discharged three-to-four times a day directly into the ocean. Berman said the waste is discharged during high tide in order to minimize the potential of an oily shower-pour on pelicans. The pipe has been there for more than 20 years, Berman said, but last year was the first time there were reported incidents of birds becoming contaminated near the pipe. The grinder pipe is unpopular with Bird Ally X, and the State Water Board wants it gone too. Berman said the district has begun to seek funding for an alternative system. But with other priorities, like planning to accommodate the bay's projected rising sea level, the fish station is not the district's top priority. Still, when a pelican problem arises, Berman said, "We try to drop things right away and fix it." It cost Bird Ally X thousands of dollars to rehabilitate the pelicans last year. To donate to this year's efforts, visit www.birdallyx.blogspot.com. The money helps pay for fish, medical supplies, temporary housing and other operating costs. For more information or to volunteer, call 822-8839.